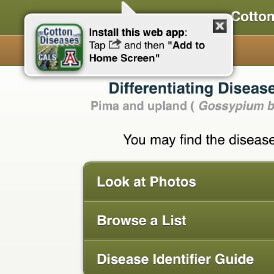 A Web App intended to share information on common diseases of early season cotton in the Southwest. 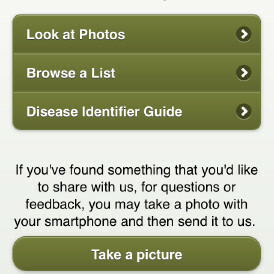 Users can easily identify diseases with photos, detailed descriptions and an Identifier Guide. 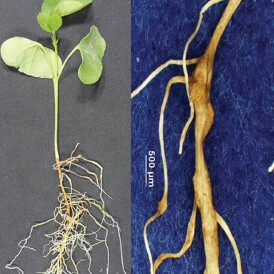 A convenient communication tool for users to get in contact with the plant specialist team at the UA. 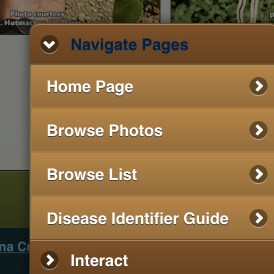 Designed to work on all smartphones and tablets (jQuery Mobile). User can save this Web App to their smartphone's home screen and use it offline (with no Internet connection).